ROCHESTER, N.Y. – Semrock, Inc., the leading manufacturer of high-performance optical filters for the biotech and analytical instrumentation markets, today announced single-band fluorescence filter sets optimized for the most popular quantum dot nanocrystals. Three of these new filter sets are ideal for brilliant multi-color imaging or quantitation with the most highly utilized Qdot 525, 605, and 655 Nanocrystals by Molecular Probes (Invitrogen Detection Technologies). A fourth filter set utilizes a special long-pass emission filter to allow simultaneous viewing of multi-labeled samples by eye or with a color camera, thus taking advantage of the common blue excitation and narrow, specific visible espectral properties of Qdot nanocrystals. Qdot fluorescence labeling products exhibit revolutionary imaging performance that comes from their robust nanocrystal structure combined with a customizable surface for a wide range of biological applications. These labels are extremely bright and highly photostable, making them ideal for applications that require high sensitivity with minimal label interference and long-term photostability, such as live-cell imaging and dynamic studies. "The pairing of high-performance 'no burn-out' BrightLine fluorescence filters with quantum dot nanocrystals—also known for their brightness and longevity—is a natural," said Semrock's CTO, Dr. Turan Erdogan. 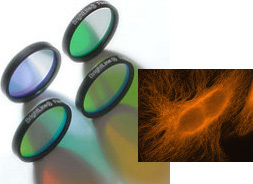 Each BrightLine filter set consists of three filters: a universal excitation filter and a universal dichroic beamsplitter are optimal for all of the quantum dots in the series, and these come with a specific emission filter tailored for the fluorescence emission spectrum of the associated quantum dot nanocrystal. The new highly transmitting, deep-blue "no burn-out" exciter achieves maximum quantum dot excitation efficiency while virtually eliminating any DAPI or Hoechst excitation—to separate nucleic identification from specific quantum-dot-labeled imaging. And with its exceptionally wide and flat transmission and reflection bands, the special BrightLine dichroic beamsplitter not only accommodates all Qdot nanocrystals (including those in the near infrared), but also does so with a wide range of possible blue and UV excitation wavelengths. The single-band emitters have the high transmission and steep edges characteristic of all BrightLine fluorescence filters, coupled with carefully optimized and narrow bandwidths to perfectly match the popular 525, 605, and 655 nm Qdots, yet achieve minimal crosstalk from all neighboring Qdots. Typical of Semrock's BrightLine fluorescence filter sets, these new quantum dot filter sets are available from stock. Every Semrock filter, without exception, is made with hard dielectric optical coatings for permanent, "no burn-out" performance.